Some varieties of plums are easy to stone when ripe. 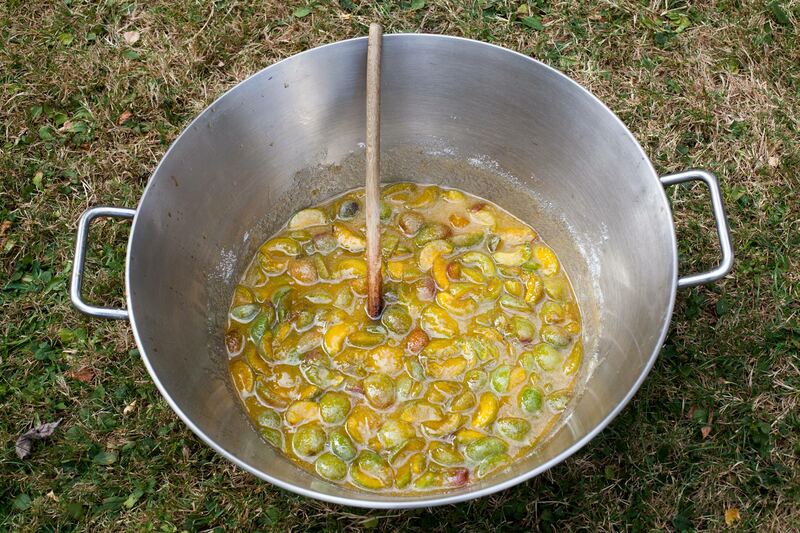 Here are simple tips I applied this weekend to make jam. I purchased three kilogrammes of “Reine Claude” at the local market in Aurillac on Saturday. From experience, I knew that they were ripe enough and of an easy-to-stone cultivar: I am used to buying plums from this producer. In a less familiar situation, I would ask to test a plum. I would bite into it to cut it in two along the line that separate the two halves. Think about the two halves of an apricot to visualise the expected outcome. Eating the first half would tell me about the taste, and leave me with the second half in my hand to test whether the stone is easy to remove. 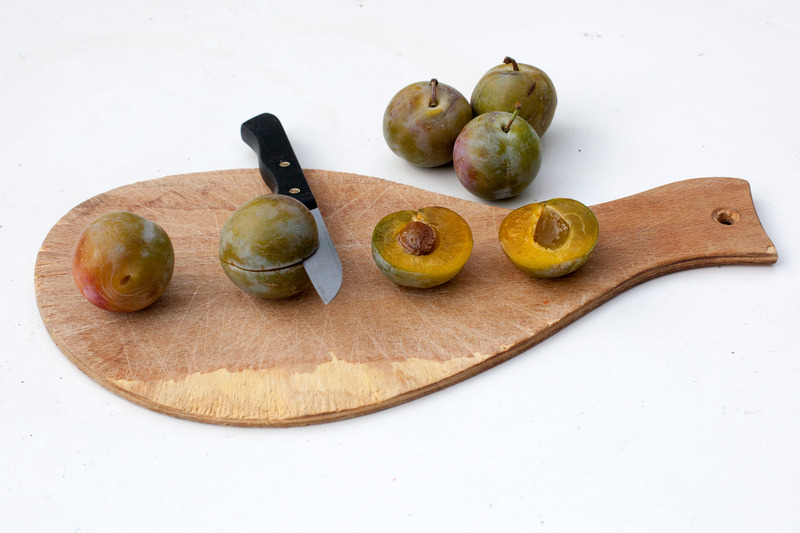 I cut this Reine Claude plum in two with a knife to show what sort of result you should aim at when biting into a plum. No flesh attached to the stone from the second half, space between the stone and the first half: stoning these plums with the thumb will be effortless. Photo 29 July, Saint Simon. Appearance is not enough, unless you already know what you are buying as I did this weekend. Some plum cultivars are easy to stone when ripe, some others very difficult, to the extent that it is better to cook the jam with the stones in some cases, removing them afterwards, as I did with the damsons I was given in the UK. 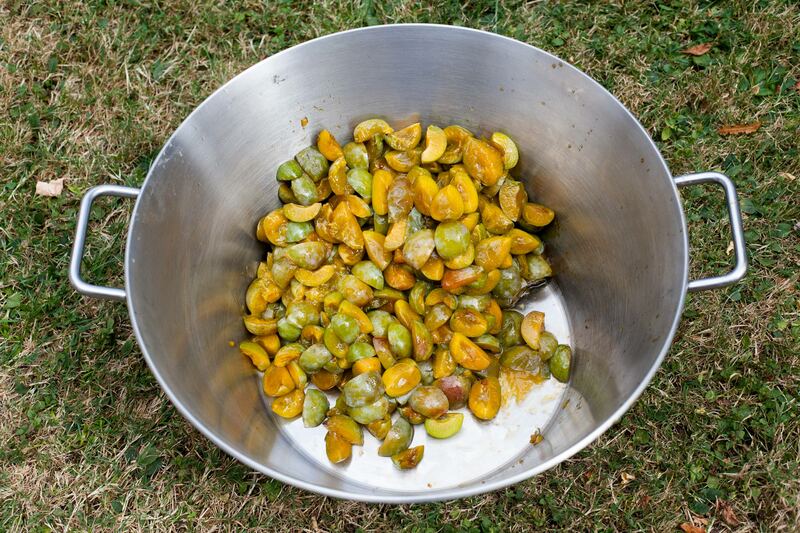 Cultivars that look similar can be quite different, and this is valid for greengages, mirabelles and quetsches. Figuring out what sort of plums you are going to use will enable you to organise the jam-making session accordingly, saving time and effort: easy-to-stone plums will be stoned before cooking the jam, other ones can also make delicious jam but will require stones to be removed afterwards. Another trick: when testing plums, choose one that looks average. Or two, one average and one that looks less ripe. The ripest ones will always be easy to stone, even if I find it more comfortable to stone slightly firmer, rather than softer, fruit. Plums, even if they are easy-to-stone ones, are not like apricots. The two halves don’t separate easily, you have to cut through them. 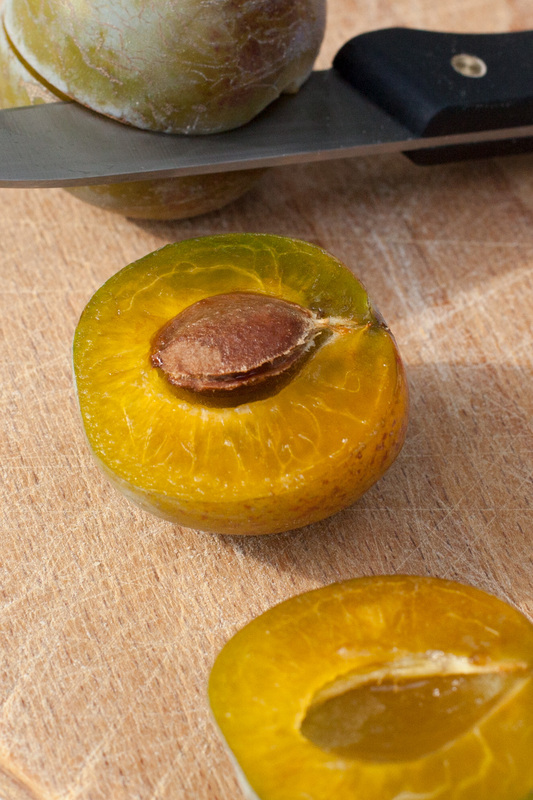 Use a small sharp knife to slit along the line around the fruit that indicates the two halves, so that the stone is in the right position to be removed (see pictures above and below). It took me less than half an hour to stone the three kilos of plums, cut them into quarters and add the sugar. Sugar and lemon juice added. The plums were very sweet and juicy. I added two kilos of sugar, the juice of two lemons and after stirring for a minute or two the mix was ready to be left to rest overnight. I cooked the jam for ten minutes the following morning. 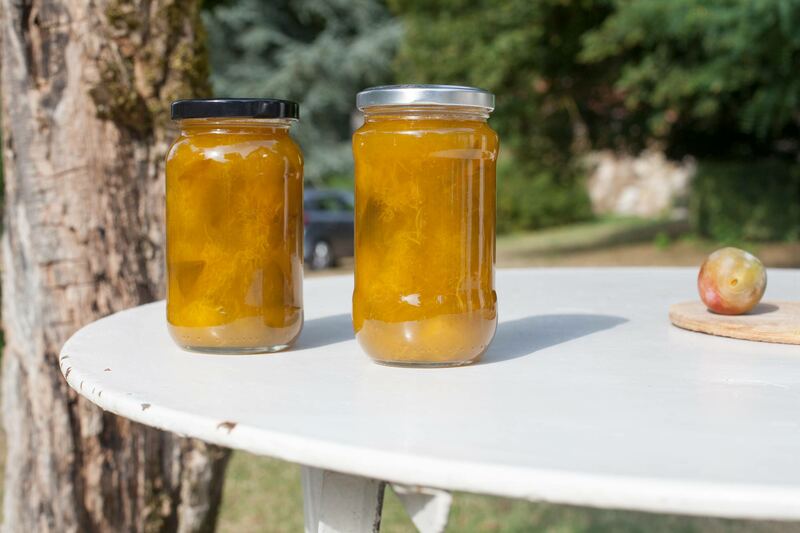 The final result was thirteen jars of a tasty “Reine Claude” jam with half-melted morsels. Quick and easy! 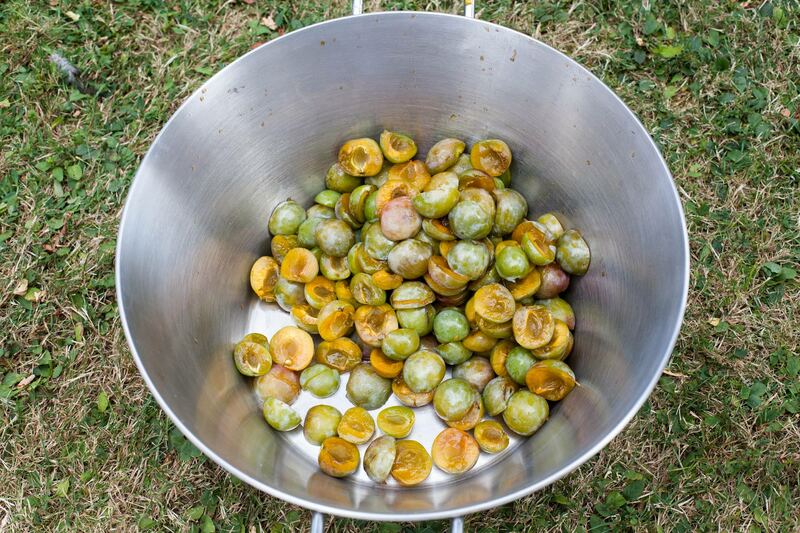 This entry was posted in Eat and tagged Aurillac, France, Plums by Les Jardins d'ici. Bookmark the permalink.